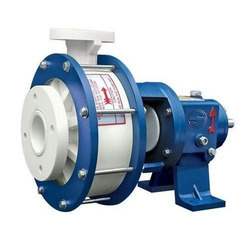 We have developed a wide range of Polypropylene Chemical Process Pump .These are made with qualitative raw material and are extensively used for various industrial purposes. We offer a wide range of Polypropylene Chemical Process Pumps. Polypropylene pumps are a horizontal single end suction standardised back pull out centrifugal pumps. PPC series anti-corrosive pumps are supplied with mechanical seal or gland packing arrangement covering 85% of the requirements. JEC Polypropylene Pumps are manufactured from polypropylene copolymer, a chemically inert thermoplastic, by the use of an exclusive moulding process. Polypropylene pumps give protection against highly corrosive chemicals. The solid moulded casing and impeller ensure a smooth running of the pump and long life with minimum wear. JEC Polypropylene Process Pump are fitted with sleeves of different materials that make these easily compatible with any type of liquid. We offer an extensive variety of Polypropylene Process Pumps. Polypropylene pumps are a level single end suction institutionalized back haul out radiating pumps. PPC arrangement hostile to destructive pumps are provided with mechanical seal or organ pressing plan covering 85% of the prerequisites. JEC Polypropylene Pumps are produced from polypropylene copolymer, an artificially inactive thermoplastic, by the utilization of a selective embellishment process. Polypropylene pumps give security against very destructive synthetic substances.